A problem as old as computers takes on a new level of complexity in the digital sharing age. Keeping all of the files and folders that we create, share, and receive nowadays is a full-time task - it's a responsibility that comes with the productivity power of our computers. We all know the best method is to organize our digital data as we create or receive it, but sometimes that just doesn't happen. 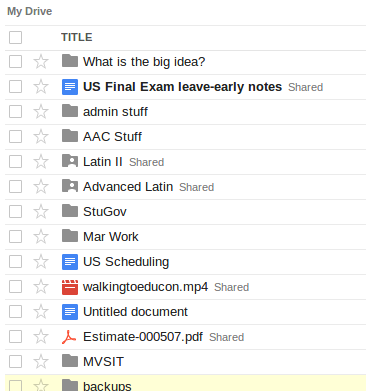 In addition to allowing us to share information with an ease never dreamed of before, Google Drive also offers multiple ways to organize the files and folders it holds for us. For me, the easiest method by far is ye olde drag & drop, and I am very appreciative of the Drive developers for keeping this function working well. Search for the file in Google Drive, and open it when it shows up in the search results. NOTE: It would be great if the search results would tell you the location of the file right then and there, but they don't. Once the file is open, close it. You don't even have to do anything to it - just let it fully load and then close the tab. That file will now be listed at the top of the "Recent" section in Google Drive, along with the file's location. And voila! What's even better is that if you didn't really need to know the location (perhaps you just wanted to find the file so that you could drag it into a folder), you can do that right from the Recent listing. Easy peasy: search, open, close, drag. Done! Hope this tip helps you as much as it's helped me! Tagged with Google Drive, productivity, organization. February 14, 2013 by Bryan Lakatos.